Most Americans greeted Treasury Secretary Jacob Lew’s decision to put Harriet Tubman, the abolitionist heroine of the Underground Railroad, on the front of the twenty-dollar bill and relegate the Indian hunting President Andrew Jackson to its back with approval. The ironies abound. Fugitive slaves like Tubman most feared being converted into cash. Slaveholders often threatened the enslaved with “putting them into their pocket” or selling their human property. Jackson, a champion of the white man’s democracy, “killed” the Bank of the United States, which controlled the nation’s supply of bank notes, the predecessor of today’s paper currency. Jackson detested secessionists and abolitionists alike for threatening the Union of the free and slave states and abolitionists like Tubman regularly defied the federal fugitive slave laws. While we are well acquainted today with the derring-do of Tubman, her story illustrates that slave resistance rather than bourgeois liberalism lay at the heart of the American movement. Some abolitionists made “running off” slaves a quintessential form of abolitionist activism. The black abolitionist Leonard Grimes was arrested and jailed in Virginia for assisting fugitive slaves. Grimes eventually moved to Boston where he pastored the Twelfth Baptist Church known as the “fugitive slave church” because so many of his congregants were runaways. White abolitionists were also imprisoned for their fugitive slave activism. Charles Torrey died in a dank Maryland jail, Jonathan Walker’s hand was branded with the initials SS for Slave Stealer in Florida, and Calvin Fairbanks was released from a Kentucky jail only during the Civil War. The abolitionist Laura Haviland confronted bloodhounds during one of her forays to the south. John Parker, a former Alabama slave, was perhaps one of the most daring conductors of the abolitionist underground along the Ohio river. Parker’s narrative abounds with military terminology when he describes his escapades, which resembled tactics of guerilla warfare and insurgency. Small wonder that Tubman was a Union Army spy and scout for the Combahee river raids during the Civil War. According to Parker, abolitionists like him had come within an “ace” of anticipating John Brown’s raid on the federal arsenal at Harper’s Ferry. Brown, who is often mistakenly viewed as an aberrant figure in the abolition movement, had asked “General Tubman” to join him. As Frederick Douglass said in his tribute to Tubman comparing his celebrity with her then anonymity, “The midnight sky and silent stars have been witnesses of your devotion to freedom and heroism.” The great black abolitionist would probably approve of Tubman preceding him and many other abolitionists in being recognized today. The daring activism of abolitionists like Tubman revolutionized abolitionist discourse and practice. Slave narratives came to constitute the movement literature of abolition providing an effective riposte to the proslavery argument and inspiring popular antislavery novels such as Harriet Beecher Stowe’s runaway bestseller (pun intended), Uncle Tom’s Cabin. The Underground Railroad arose in areas in the north with significant free black populations and abolition societies. These nodes of abolitionist activism, Boston, Syracuse, Christiana, and Oberlin, became the sites of dramatic fugitive slave rebellions in the 1850s. On the very eve of the Civil War, Tubman led a crowd to forcibly rescue the runaway slave Charles Nalle in Troy. “Self-emancipated slaves,” as Garrison called them, also found their way into Indian territory, Mexico, Canada, the Caribbean and even stowed away in ships all the way to Britain making their freedom claims the stuff of international law and diplomacy. The strenuous efforts of slaveholders and the American government to secure the extradition of slave rebels and runaways failed. Abolitionist legal theory, often dismissed as higher law, made human rights a central component of jurisprudence and politics. Without significant numbers of “freedom seekers” voting with their feet, there would have been no fugitive slave controversy between the north and the south. Their actions foretold the defection of runaway slaves into Union army lines, who helped initiate the emancipation process during the war. 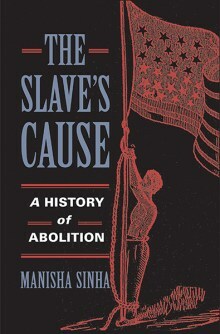 In more ways than one, abolition expanded the horizons of American democracy. Some have glibly dismissed the movement as a failure, in our contemporary political parlance as “a bunch of losers.” Abolitionists however never stopped pushing at the boundaries of their society and laid the foundations of the interracial democracy we still aspire to. Perhaps it is only fitting that the slaveholding President, who upheld the authority of the federal government and the Union against South Carolinian nullifiers, forming an important political precedent for Abraham Lincoln, shares space with Tubman, who like thousands of former slaves joined Union forces to put down the slaveholders’ rebellion. Or perhaps it is the greatest irony of history that a slaveholder and a slave together represent the American state today. Manisha Sinha is a professor at the University of Massachusetts, Amherst, and is the recipient of fellowships from the National Endowment for the Humanities among several others. She is the author of The Slave’s Cause: A History of Abolition and The Counterrevolution of Slavery: Politics and Ideology in Antebellum South Carolina. I found this site looking for Southern abolitionists. Defenders of monuments to Confederate officers on Alabama public grounds maintain that the monuments represent “history.” Their claim fails because they represent only one side of that history. If this author has additional names of Southerners who opposed slavery during the Civil War or served in the Union army I would appreciate learning of them.